2016 Trail Symposium is Tomorrow! Join the Capital Trails Coalition on November 17 for the third annual Trails Symposium! We’ll learn about and discuss the progress of the Coalition’s first year, dig into current trail development topics, and look forward to the year ahead. The Capital Trails Coalition seeks to create a world-class network of multi-use trails that are equitably distributed throughout the Washington D.C. metropolitan region. Over 20 agencies, non-profits, business improvement districts and organizations are part of the Capital Trails Coalition. Learn more about the Coalition here. The Coalition launched publicly on Oct. 13, with an outpouring of support from across the region. Read more about the Coalition’s launch here. Agenda is forthcoming. Lunch will be provided. Please contact Katie Harris, Trails Coalition Coordinator, with additional questions (katie.harris@waba.org). VRE’s plan would expand into a developing community absent of considering the obvious impact not only to the residents of this community but to the community development efforts and livability factor of such a facility. These rails have been abandoned for decades and New York Ave. is becoming a residential and retail destination which will connect many of the communities from NOMA to Fort Lincoln. Today, there is an existing 70 foot buffer between Amtrak Trains & New York Ave, which is used in part by Douglas Development as well as the planned trail connection along New York Ave. which will bring safe multimodal infrastructure to the community. Removing that buffer and storing idling diesel powered trains up to the curb is infuriating and is clearly a lack of engagement and care for the lives of people who live in this community. Moreover, Virginia has much more space to store trains within its own state lines and close Proximity of D.C. but of coarse they wouldn’t dare dump on their own development projects. VRE could easily store their trains at the proposed Long Bridge Park Pool Site which still hasn’t broken ground or in Potomac Yards where they have decommissioned that entire rail yard and is redeveloping. Future Transportation Plans Along NY Ave.
As you can see in the picture below, the The proposed train storage yard extends beyond Montana Avenue. Where is VRE in the Process? In May of this year, VRE released it’s solicitation to establish a Contract with one (1) qualified and experienced firm to provide environmental documentation, public outreach and participation, real estate acquisition, urban design, survey, geotechnical investigation and engineering design services for a midday storage facility for rolling stock operated by Virginia Railway Express (VRE). Proposals were due on the 13th of June. It is important that as more information about this project becomes available that we align ourselves with the residents and leadership of the impacted areas and do our part to make light of this potential travesty. The link to the Conceptual Engineering Documents by VRE is below. 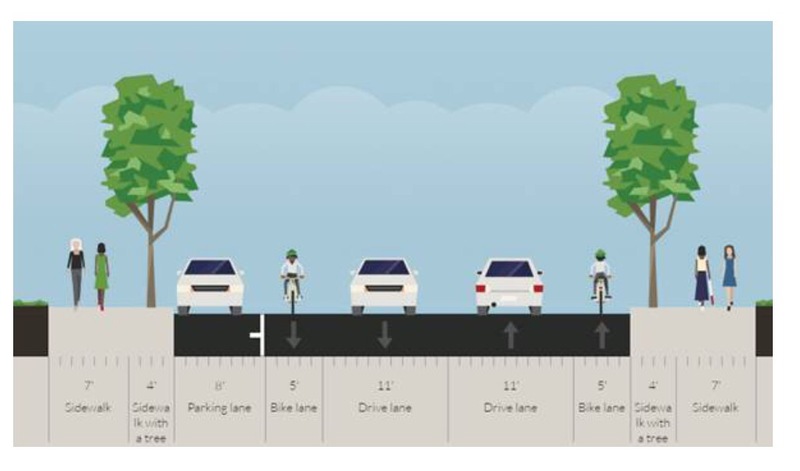 Fort Lincoln Bike Lanes Draft Plan – Ready for Initial Community Comment! On June 9, 2016, DDOT will present the draft plan for on-street bike lanes in Fort Lincoln at our ANC Single Member District Meeting for community comment. This is an opportunity for residents to provide comments and ideas for enhancements. 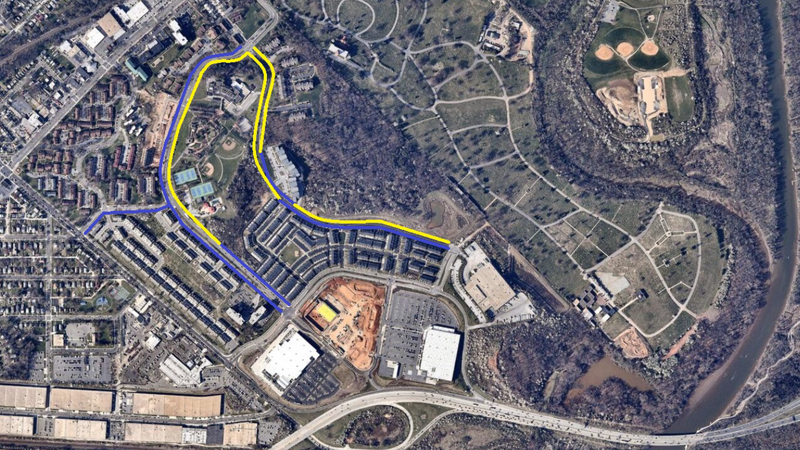 Please note that this does not include the off-street bike trail enhancements through Fort Lincoln to the planned Anacostia Riverwalk Trail Connection. That trail plan meeting will take place next year. 1. 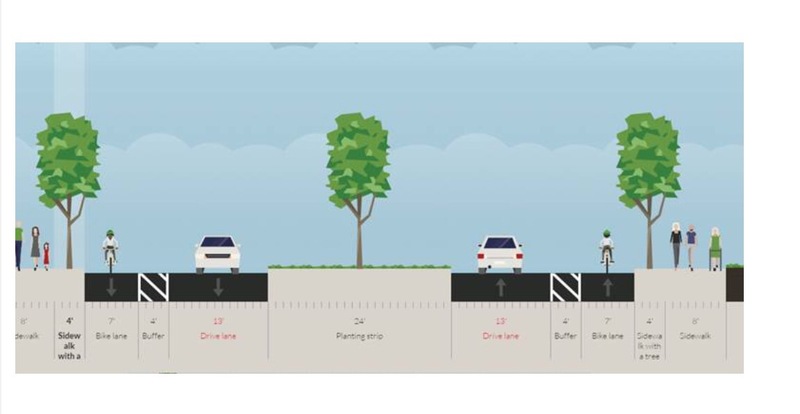 Provide safe on-street bike access through the Fort Lincoln Community to the planned connection to the Anacostia Riverwalk Trail. 2. Provide solutions that will assist with traffic calming and minimal impacts to residents. 3. Make use of under-utilized streets which are contributing to unwanted criminal activity and illegal dumping. 4. Create a plan that is flexible and gives the community the ability to make modifications as needed in the future. – Connection To the Anacostia Riverwalk Trail & Planning around Development. As we get closer to the engineering phase of the community’s connection to the Fort Lincoln/Gateway Segment of the Anacostia Riverwalk Trail (ARWT); bike lanes are critical in introducing multimodal transportation infrastructure before the cars associated with our Shopping Center and large mult-family development currently under construction are completed. Currently our entire community is treated as a highway due to a lack of metered intersections, wide medians & off street parking in our sub-divisions. 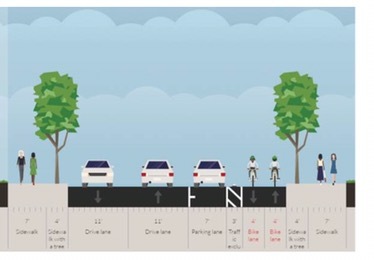 The bike lanes will help in calming traffic by visually making motorist aware that this is a residential community and make them aware of cyclist. 1. Review the presentation by DDOT and provide comments during the June 9, 2016 SMD 5C03Meeting as well as the as full ANC 5C meeting in June. 2. Between July & August 2016 the engineering phase will take place. 3. 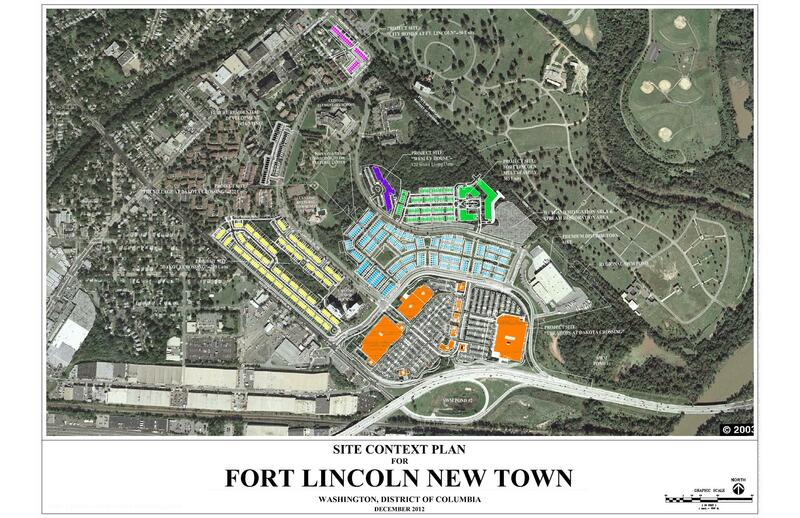 In September 2016, the Fort Lincoln Community will provide comment and vote on the plans. The comments and support will be presented to the full ANC 5C for vote. There is also a general public comment period. The goal is to have the lines painted before the Winter. The diagram below represents the overall bike lane plan. The blue lines represent bike lanes WITH parking and the yellow lines represent bike lanes WITHOUT parking. On segments of Ft Lincoln Dr where there’s no demand for parking (adjacent to the park, for instance), we would widen out the bikelane to keep that single traffic lane profile for safety. Join us as we explore bike lane & trail options through Fort Lincoln for our upcoming connection to the Anacostia Riverwalk Trail on Saturday March 12, 2016 from 11:00am to 12:30pm. We are meeting at the corner of Bladensburg Road and South Dakota Ave. Please bring your most innovative and creative ideas to engage in creating a safe and exciting transportation alternative! Please note that this is a “walk-through” on foot, however feel free to bike to the meet-up location. Register on Facebook at Fort Lincoln Bike Trails & Lanes to receive copies of handouts during the walk. New York Avenue, between the Anacostia River and the Brentwood Parkway will increase the number of residential developments upwards of 300o units. The New York Avenue Corridor has scores of planned big box retail, industrial building reuse, new hotels, and potential Municipal office realignment which will add to the traffic density. Earlier this month I proposed the possibility of using a portion of the Amtrak Right-of-Way, running parallel to the proposed bike trail along a portion of New York Ave, and designed to move people to the places they need to go along New York Ave and adjacent neighborhoods. The majority of the route would avoid congestion by running adjacent New York Ave but off the main road. The idea is in its infancy and will need extensive modification with upcoming developments and has not received any level of approval. This is part of a broader plan to provide a comprehensive transportation network to the residents of this community who’s homes are divided by rail road, major arterial roads and industrial land use. This route is suggested to work in connection with the Circulator and traditional Metro Bus Service. It is time that we update and modify the bus routes for the changing needs of residents and visitors, especially our streamlining and reducing travel time for Seniors. I believe this will encourage increased ridership,as well as the dependency and efficiency of our mass transportation infrastructure. All diagrams are options for the community to weigh-in and comment on in upcoming meetings. In January of 2015, I proposed resolution in support of connecting Fort Lincoln and the surrounding Gateway communities to the Anacostia Riverwalk Trail. This resolution was the culmination of years of problem solving and vision for connecting our communities to the city core without the use of cars. Most of the planning for this happened in 2013 & 2014 by introducing the idea to a group of neighbors who were also cyclist, however, the idea needed the support of the previous Advisory Neighborhood Commission (ANC). Knowing the amount of work it would take to pitch, plan and manage the development of the idea, I decided to run for the ANC position myself to ensure its implementation. During my campaign I pledged to help bring alternative transportation options to the community given the current traffic issues we faced and the future traffic issues the remaining development posed in Fort Lincoln. For example, the recently completed Villages at Dakota crossing development introduced close to 600 cars to Fort Lincoln alone; coupled with the Shops at Dakota Crossing and and 3 more dense residential developments the number of cars in for Lincoln will increase into the upper thousands without any change to the transportation infrastructure. Therefore, after a successful Fresh Start in Fort Lincoln, The City and one new DDOT Director later, i’m please to announce that the feasibility study for the trail connection is now complete. I exceptionally pleased with DDOT and its commitment to ANC Commission 5C’s concerns. We now have to find funding to make this a reality so that we can reduce the dependency on cars as well as safely connecting residents to the rest of the city. This bike trail represents the catalyst for a broader more comprehensive plan of connecting the outlying communities of the city to the city’s core with alternative and efficient transportation. There is a dearth of bike trail & Lane connections for more than 5000 residents in the Langdon, Woodridge, Gateway & Fort Lincoln Communities. My hope is that the City will see this connection as a priority as it continues to enhance other trails and lanes throughout the city. More information will be provided at the upcoming ANC 5C Meeting. Thanks to everyone who has participated in making this a success thus far. I have drafted the comprehensive plan based on the first 6 months of service to the community. I have been working diligently to address the major concerns of the community and am now ready for the city to provide resources to fund them. Below is the Fort Lincoln Comprehensive Plan Draft to be considered for the upcoming budget proposal 2016 to the Mayor. Additional comments are welcomed however, please note that not all comments will be added at this time however, as we resolve the items listed in the plan we will add the new ones. Thanks again for electing me to work for you.